Wedding preparations are well under way for Dublin presenter Blathnaid Treacy. 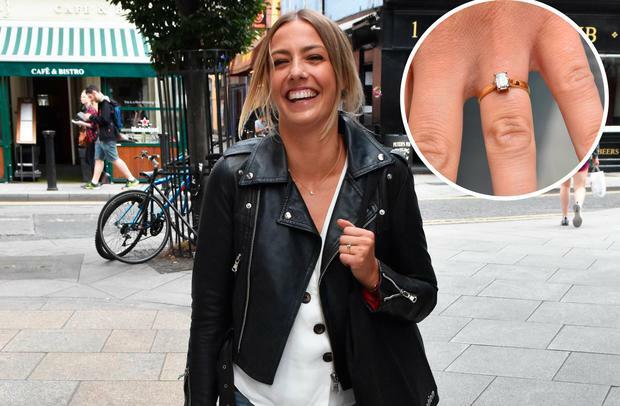 The TV host revealed she has found her dream dress and insisted that tying the knot with musician boyfriend Charlie Moon will be "nice and calm". Blathnaid, who presents Dancing With The Stars spin-off show Can't Stop Dancing as well as the National Chart Show on RTE 2fm every Friday, announced last August that her long-term beau had popped the question. "Mexico really was a trip we'll never forget... so great to be home and celebrate with friends and family," she said on social media while flashing her sparkler. While she is staying coy about the finer details of her big day in the summer, the former Glenroe child star told the Diary that she had spent the past few months organising her dream bash. But plans will take a back seat while the new season of DWTS keeping her busy. "I've loads done, so I guess it has taken a back seat now," she said. "I organised quite a lot months ago, so I have been able to take a step back. "I've been chipping away slowly but surely for the last couple of months at it. We have the venue and the dress and stuff like that sorted. "I've never done anything like this before, so it's all new to me." With a hectic three months ahead, Blathnaid insisted she would be taking a calm approach over the smaller details of the wedding because that was the atmosphere she was aiming for. "I don't want to be stressed out about it," she said. "I want it to be nice and calm and relaxed - that's the vibe we're going for. "So we're just going to keep going nice and easy for now until we get there." Blathnaid has filled the shoes of Glenda Gilson on Xpose over the past few months, while the model took time off on maternity leave. "It was a busy few months but I'm finished up with Xpose now, so I'm ready for the new series [of DWTS]," she said.